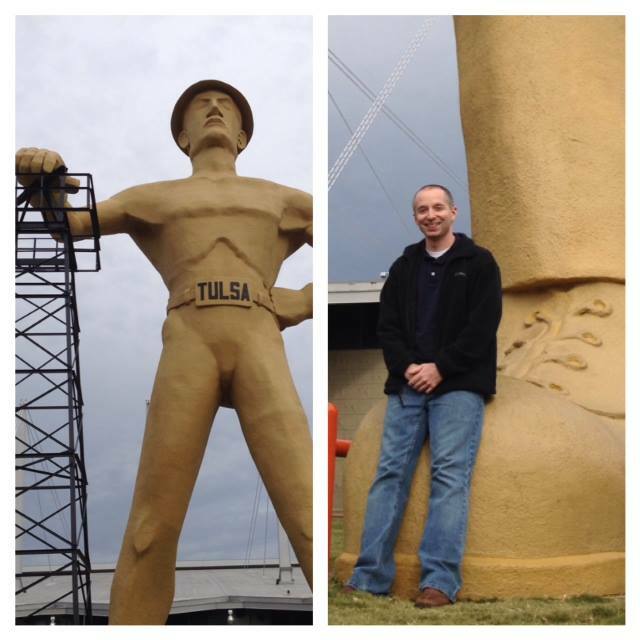 On a recent visit to Tulsa, I just had to stop by this giant quirky statue known as “The Golden Driller”. It was built back in 1953 by the Mid-Continent Supply Company of Fort Worth for the International Petroleum Exposition. The statue became such a hit that it was donated to the city of Tulsa where it remains today. As you can see, the driller’s right hand rests on an oil derrick which came from a former oil field in Seminole, Oklahoma. While I’m probably not the best to show a contrast of size – I stand 5 feet 7 inches and barely hover over the foot!